A Facebook commenter says: "Sometimes intuition is wrong. Intuition told early man that the Sun revolved around the earth. It was logic (using factual evidence) that corrected that error. Both intuition and logic inform our thinking processes. The proper place for intuition is in situations where the evidence is not sufficient to lead us to a sound conclusion. The point re not ignoring our intuition is well taken and valid but it's important to remember that intuition is simply evidence of another sort and must reconciled with and deemed to be less reliable than factual evidence. Let's not fall into the same errors that our less enlightened ancestors did." So what do you trust more: Intuition or Logic? Sadly I think I have a bigger "gut" than brain......but then I have my dearest who is the King of logic~~~The best of both worlds...haha. Sometimes I wish I wasn't suich a "feeling" person. That drawing is really cool. King of Logic! I love that Wanda! 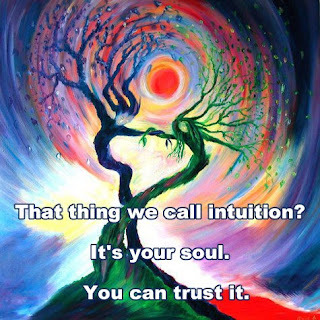 I have to say intuition. Without it, I would have logic-ed my way out of some of the greatest things in my life, but also would have avoided some of the worst mistakes. I would rather have that, though, then no "life" at all. I so agree Ma. I would have never retired at age 49 if I had looked for the logic in it. Looking back it was one of the best decisions of my life.